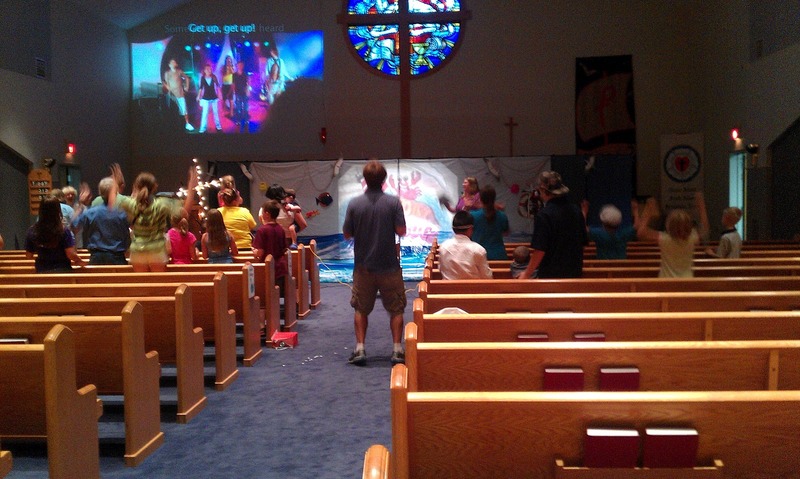 Eric's parent's church were having their Vacation Bible School this weekend. We enrolled the boys with their cousins. 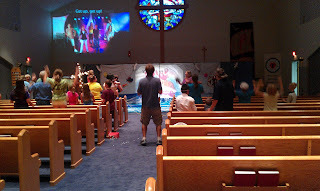 It was a completely different sort of VBS than we are used to, a few hours on Friday night, and a few more on Saturday, with a Closing on Sunday. At first I thought, Oy, this will be extremely inconvenient to drive into town to drop off and pick up, for only a 2 1/2 hour break. But then Friday evening, after Eric and I went to Therapy, I saw this. My boys (Chris is on the right under the wing of an older boy, and Sam is in the front on the left being held by someone else) were having a great time. They got snuggled and loved on, and you know, you can never have too many people loving your children. So we let them. I know that my boys are a Miracle and that they bring Joy to me through their Miraculous nature, but for some reason, it always seems to surprise me, when they bring it to others. There was a VBS earlier this summer that I pulled Chris out of earlier this year, because they Didn't get it, didn't get the Wonder that is Christopher. They said he was too crazy last year, the crew leaders didn't know what to do with him, and that they had wanted me to a. drive far, b. follow Chris around (be on his Team), and c. they wanted me discipline him so that they didn't have to. At first I was going to do it. But then I started thinking about it, I had planned to pull Chris from day camp to do it, but if the church was unprepared (and unwilling to prepare) for my special needs child, then I was going to just leave him where he was, where he was happy, and where they were prepared for him. It made me feel bad, feel lazy, like I was depriving Chris because I didn't want the inconvenience. But I decided, No, he is a Gift. To most people that get to know him, learn his story, he is a Miracle. The teenagers at Messiah and St. Andrews got that, if they reached out for a hug, they got the biggest magic hugs back, and they loved him. So if the folks at the church (hello irony) aren't touched by that, then forget them, I'll keep my Sweetboy where he is Cherished. We'll be keeping him out our Messiah, and at St. Andrew's, because they love them, and I love anyone that loves my boys.